P&O’s long awaited five-ship Sydney spectacular took place earlier this week, with the entire P&O Australia fleet sailing side by side into the city’s famous harbour. 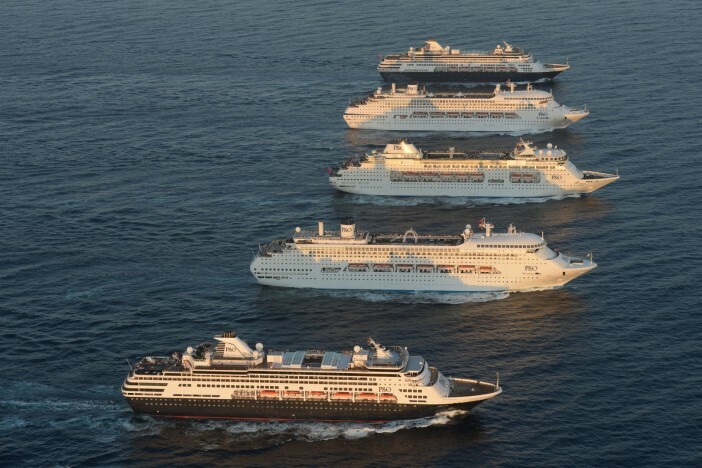 With a total of five P&O ships in attendance, the event made the history books — on account of it being the first time five large cruise ships have ever docked in Sydney Harbour at the same time. The event, which has been in the planning process for what feels like years, went off without a hitch, as the five P&O Australia ships — which include Pacific Dawn, Pacific Jewel, Pacific Pearl, Pacific Aria and Pacific Eden — sailed together in a v-formation into Sydney’s famous harbour front. Here, the cruise line officially introduced its new ships, Aria and Eden, to the P&O fold with an evening of live music, entertainment and fireworks. Among those in attendance were singer Jessica Mauboy and actress Kate Ritchie, who had earlier “christened” the new ships via Twitter ahead of their arrival in Sydney. With the arrival of Pacific Aria and Pacific Eden, P&O Australia has cemented itself as Australia’s largest year-round cruise operator, offering more Australia-departing cruises than any other cruise line. In total, P&O now has a fleet-wide capacity of around 9,000 passengers — something which will undoubtedly help the Australian cruise market to continue growing at a rapid rate. If you’re interested in keeping up to date with news and information from P&O Australia, as well as the other major cruise lines which operate Down Under, stay tuned to the Cruise1st blog for the latest updates as they unfold.